Golden Rice provides a simple and direct method of introducing vitamin A into the diet unmistakably. Unfortunately the rent seekers of the environmental movement have locked on to the GM angle indiscriminately only because it is a trivial lie to sell to the paying public. Some GM work has been mercilessly gamed and richly deserved to be challenged. However when we have a clear need that is completely resolved through this technology, then it is time to back off. However, the likes of Green peace is quite happy to peddle outright bogus science if it allows them to grab headlines and grab more donations. Besides. A lot of this advocacy is tainted by hidden corporate agendas of their own. It appears that all good ideas can be corrupted if one tries hard enough. Similar things can be done with other feed stocks and will be. It is time the whole issue of GM is thrown open to a public debate and we arrive at a working consensus. Vitamin A is vital for preventing childhood blindness, which affects 500,000 children worldwide each year. Greenpeace is against using genetically modified rice which is enriched with a lot more Vitamin A. There are now clinical studies that show the rice is 100-150 grams of rice (half a child's daily intake) provides 60 per cent of the vitamin A that is needed. Natural sweet potatoes has been shown to provide needed vitamin A. However, some children will prefer to eat rice and some may not have access to the sweet potatoes. More controversial than the naturally bred sweet potatoes is Golden Rice - genetically engineered to contain 30 micrograms of beta-carotene per gram. Ordinary rice has none. Critics had claimed that the rice is impractical. According to calculations by Greenpeace, people would need to eat huge amounts - as much as 18 kilograms of cooked rice a day - to obtain enough vitamin A, but they are wrong by over 100 times. A study involving 68 Chinese children demolishes the criticism. Guangwen Tang of Tufts University in Boston, Massachusetts, and colleagues have demonstrated that just 100 to 150 grams of the rice - about half the children's daily intake - provided 60 per cent of the recommended daily intake of vitamin A. An editorial in the New Scientist makes the case that Greenpeace needs to drop opposition to using genetically modified rice to prevent blindness and vitamin A deficiency. A two-year project involving 10,000 households in Uganda found that vitamin A intake doubled in women and in children aged 6 to 35 months who ate the improved sweet potatoes compared with families that continued eating regular varieties. By the end of the project almost 90 per cent of the kids eating the new strain had escaped vitamin A deficiency, compared with just 50 per cent in a control group. 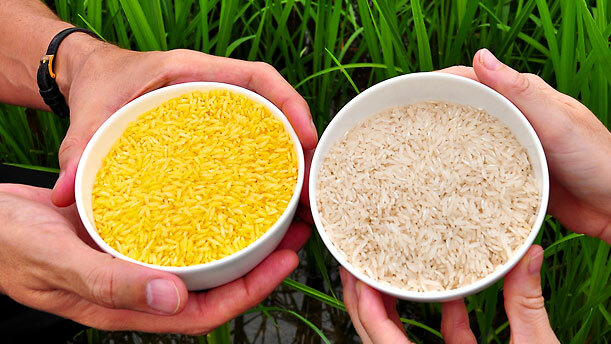 ONE of the more unedifying aspects of the fight over genetically modified food has been the unbending opposition of Greenpeace and others to rice that has been modified to help prevent blindness. Golden Rice contains a precursor of vitamin A, deficiency of which blinds an estimated half a million children every year. Opponents of the rice are not oblivious to the tragedy, but argue there are other solutions. They are correct. One has just been found effective in Uganda - a naturally bred, fortified sweet potato. Good news, but no single solution will work everywhere. To eradicate preventable blindness, we need as many options as possible. The sweet success of the potato doesn't mean that GM can or should be taken off the menu. So it is also good news that the latest research into Golden Rice bolsters the case for its adoption (see "Nutrient-boosted foods protect against blindness"). In light of this, opposition to Golden Rice increasingly looks like bullheadedness rooted in a desire to halt GM at any cost. There are reasons to be wary of GM promoted by big business. But tarring a humanitarian project with the same brush is dogmatic - and wrong. I would be surprised if GM food is as trouble-free as it is promoted. There will be many contaminants in there as well as the target DNA, and it may cause conditions that will take a lifetime to assess. I'm sure thalidomide was promoted in the same way, and it took a long time to realise the problems it caused. I suppose the Third World is the usual place to try these things, but it would be nice to see America using its own people as guinea-pigs for once. Then at least the manufacturers can be sued.